Welcome friends and family members in style with a beautiful new entrance door from Renewal by Andersen® of Kansas City. It will transform the look of your home! Replacing your old, tired front door with an attractive, rugged new entry door can enhance your home’s look, improve security, and boost the energy efficiency of your home. Renewal by Andersen® of Kansas City has an entry door to fit almost any architectural style and home improvement budget. All of our entry doors are engineered and manufactured to deliver superior structural strength for years of reliable service. Whether you choose a traditional wood door, durable steel frame door, or advanced composite door, you can rest assured that it will be custom sized and manufactured specifically for your home. A perfect fit is guaranteed! 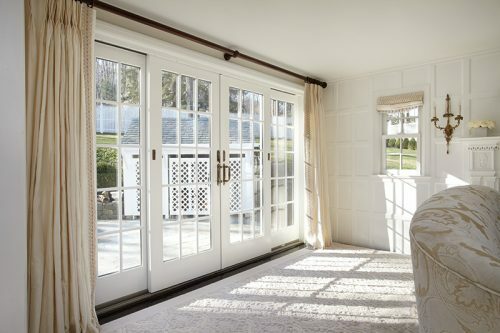 Today’s entry doors are also highly energy efficient, serving as a thermal barrier to reduce energy loss. That helps to cut the energy used to heat and cool your home, resulting in lower monthly utility bills. All of our entry doors carry the EnergyStar® rating. To match your home architectural style and décor we offer a wide variety of door hardware options, including bright brass, satin nickel, oil rubbed bronze, and matte finishes. For your peace of mind, our entry doors feature advanced locking mechanisms, including deadbolts. Your safety and security is our priority! For a FREE estimate on a new entry door in Kansas City, schedule a FREE in-home consultation by calling Renewal by Andersen® of Kansas City at (913) 385-1300. Or simply complete our handy request form.